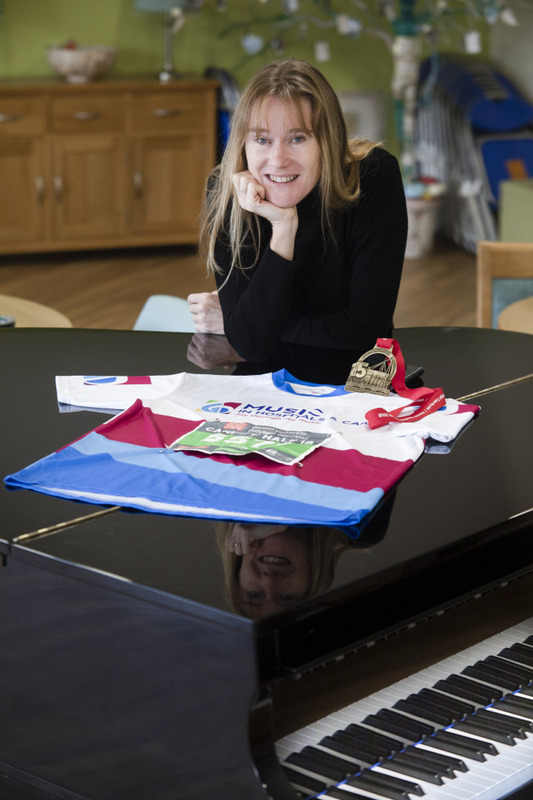 A Gwynedd musician-in-residence defied doctor’s orders to run a half marathon to raise money for a charity she cares passionately about. 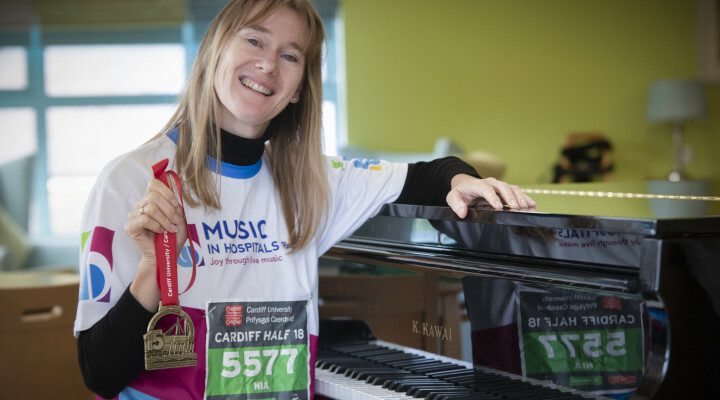 Nia Davies Williams, 46, who works at Pendine Park’s Bryn Seiont Newydd Care Home in Caernarfon, tackled the Cardiff Half Marathon despite having badly bruised ribs. Nia, a leading authority on the use of music in the care of people with dementia,raised £200 for Music in Hospitals and Care in Wales. Last year her work at Bryn Seiont Newydd was rewarded with the Sir Bryn Terfel Foundation Wales Care Award for Promoting the Arts in Social Care. She said: “I really wasn’t sure I was going to be able to take part and my doctor’s advice was that I shouldn’t run as it would be too painful. But I thought I’d give it a go and it wasn’t too bad. I did the same run last year and actually my finishing times were within seconds of each other. 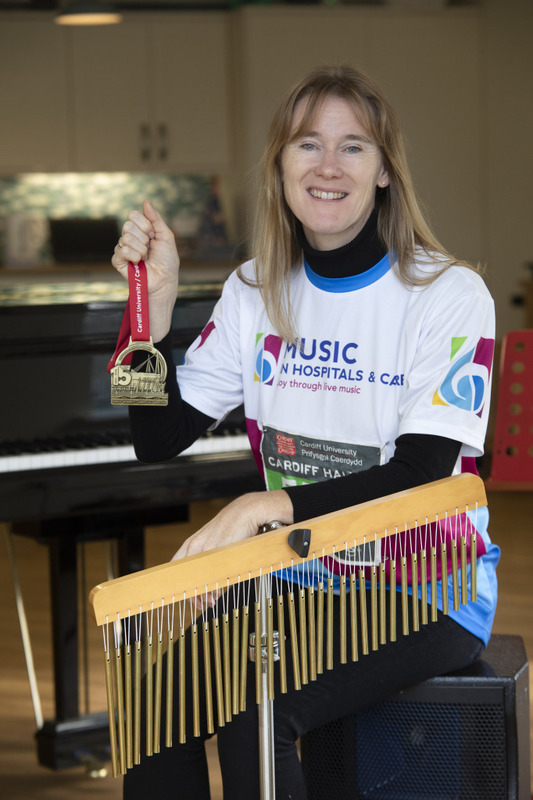 “I wanted to raise funds for Music in Hospitals and Care in Wales that works to take live music to patients or those in a care environment. 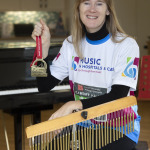 “I’m an ambassador for the charity and we provide a variety of musicians to hospices, care homes and hospitals to play for patients and residents. It’s about matching the right musicians to the patients. “A ward full of teenagers might want pop music while a harpist might be appreciated more in a care home for the elderly. But Nia, who is a mum of three grown up children and has one grandson, Nedw, who is one, really thought she’d have to pull out of this year’s half marathon after hurting her ribs in a swimming pool mishap in Greece. She said: “I was with my partner and as he was celebrating his 50th birthday we went to Athens for a break. I was in a swimming pool when he accidentally bashed into me and I was left with bruised ribs. It was so painful. 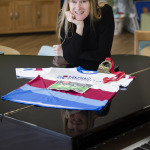 “I went to the GP and was told I shouldn’t run but when you see cancer victims and other sick people lining up to race I just thought I had to give it a go. She added: “But with all that’s been going on I really couldn’t train as I normally would and I it would have devastated me if I’d gone over the two hour mark. In the event I managed it in one hour 53 minutes, the same time as last year. “There’s 20,000 runners doing the race and it’s quite emotional at the start. I was determined to finish it though as I already had quite a few sponsors and didn’t want to let them down. Pendine Park proprietor Mario Kreft MBE congratulated Nia on her efforts and for raising money for such a good cause. He said: “The arts are central too much of what we do at Pendine Park and Nia is absolutely right when she say music has the power to help hospital patients and those living in a care environment. This entry was posted in Arts, Charity, Community, Featured, Health, News. Bookmark the permalink.